Port Regulations, established by Proclamation, bearing date sixth February, 1819, to be duly observed by all Masters or Commanders of Vessels, whether British, foreign or colonial, at Port Jackson; and by all Merchants, Importers, Consignees, and Others, residing in His Majesty’s Territory of New South Wales and its dependencies &c. &c. &c. Hobart Town: Printed by Andrew Bent, Government Printer. 1822. The regulations were proclaimed by Governor in Chief Macquarie on 6 Feb 1819. Pages -10 comprise the regulations referred to in that proclamation. Page 11 has additional local regulations for the Derwent and Port Dalrymple dated Apr 3 1819. The Colonial Office copy was sent to the Colonial Office by Governor Arthur in his despatch of 1 Nov 1827. [First Annual Report of the Wesleyan Methodist Sunday School] On 25 May 1822 the HTG noted that ‘the First Annual Report of this Institution has just been published and circulated’ (presumably this meant it had been printed) and made some extracts. Not in Ferguson. No copies. 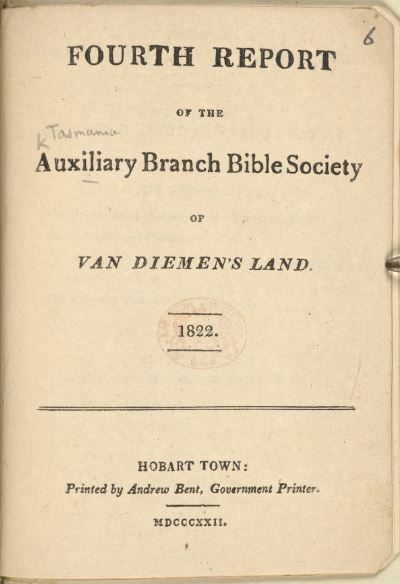 Fourth Report of the Auxiliary Branch Bible Society of Van Diemen’s Land. 1822. Hobart Town: printed by Andrew Bent, Government Printer. MDCCCXXII. 30p. Not in Ferguson. Copies: BL. A copy (recently printed) was received in Sydney and noted in Sydney Gazette on 1 Nov. 1822. BL copy is bound with Michael Howe and other pamphlets in a volume belonging to surveyor Thomas Scott and which bears his Earlston book plate no. 908. Government public notice, (12 Dec. 1822) re building on and fencing of town allotments. Broadside, 8 x 6 in.